Ed Zink talks about some of the plants they are growing in the wetlands as part of the project. 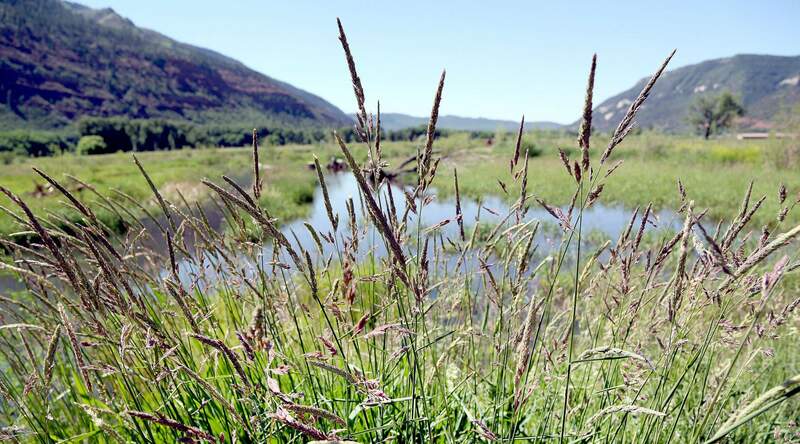 Ed and Patti Zink are converting 50 acres north of Durango from hayfields to wetlands through a company they set up called Animas River Wetlands. 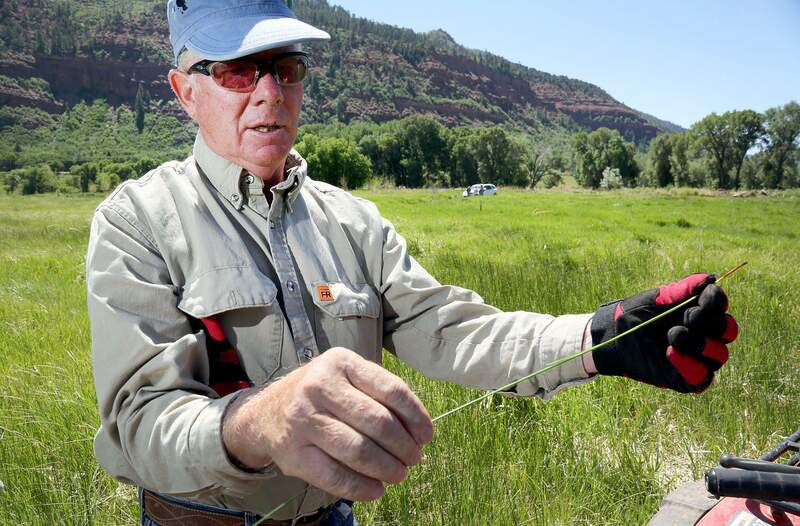 Ed and Patti Zink are converting 50 acres north of Durango from hayfields to wetlands through a company they have set up called the Animas River Wetlands. 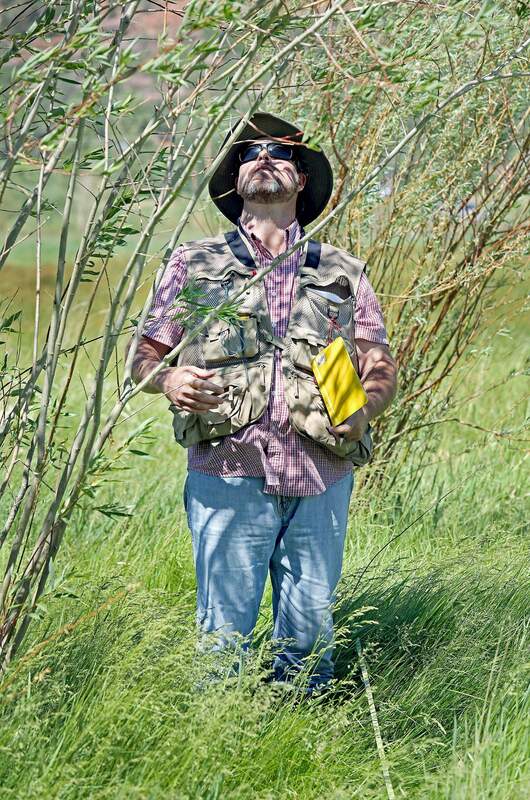 Biologist Mark Lawler of SME Environmental Consultants checks the height of willow trees. Seventy-nine plots on the property are monitored periodically. An Animas Valley couple are reversing the familiar progression of land utilization  open space to agriculture to urbanization. Ed and Patti Zink are six years into restoring 50 acres of their Waterfall Ranch to the wetlands they originally were. The Zinks in 2006 bought 100 acres east of U.S. Highway 550 about four miles north of the stoplight at Animas View Drive. Eighty acres of the parcel, including the wetlands, are in a conservation easement, which protects it from development in perpetuity. Slowly but surely, the wetlands are taking shape, irrigated by 1.25 cubic feet per second of water from the Animas Consolidated Ditch. The ditch, which serves scores of agricultural operations, runs from mid-April to mid-October. The Zinks also have the right to 2 cfs from Falls Creek, usually available only in early spring. Their right to the water is secondary to the Falls Creek community, located over the ridge to the west. Wetlands provide multiple benefits, Patti Zink said. They store water and release it slowly, help reduce erosion, filter pollutants and sediment from water, store carbon, make habitat for wildlife and are nurseries for native species. The Zink wetlands will become a bank to satisfy the environmental-protection requirements of projects that invade sensitive areas. Kara Hellige, chief of the Durango regulatory office of U.S. Army Corps of Engineers Sacramento district, said it works this way: Any project that imperils wetlands must avoid or minimize its impact. If the full impact cant be mitigated, the project can create wetlands on site or elsewhere or turn to a bank such as the Animas River Wetlands created by the Zinks to buy an amount of wetlands equivalent to what would be lost. In improving the intersection of County Road 311 and Colorado Highway 172 for safety, La Plata County is going to affect 0.74 of an acre, Hellige said. The county is going to buy that much of the 50 acres owned by the Zinks, she said. The purchaser of wetland credits avoids the work and the responsibility of maintaining a wetlands, Hellige said. The seller of the credit is responsible, she said. The Mitigation Bank Enabling Instrument that the Zinks signed with the Corps of Engineers is a looseleaf binder 1¾ inches thick. Building a wetlands bank is an arduous task, Hellige said. Indeed it is, Patti Zink said. In the late 1950s ,when powerful tractors became affordable, Ed Zinks father, John, moved earth and leveled land to turn wetlands into hayfields. When he sold the property in 1986, he had the foresight to get into the contract a first-right-of-refusal for the family in case the new owner someday sold. Ed and Patti Zink, who exercised the right, are working with SME Environmental Consultants to create wetlands. The work is being done in phases and includes stabilizing the banks of the Animas River; planting such species as sedges, willows and cottonwoods, and installing logs to build habitat for invertebrates. The result of work to date has been impressive, said Mark Lawler, a biologist with SME, during a break in monitoring some of the 79 plots designated for gauging progress. Aquatic and wetlands flora and fauna are visible, Lawler said. Birds in increasing numbers are being counted. A beaver has found the wetlands and is doing what beavers do  felling cottonwoods. In 2009, bird-watchers counted 26 species in the budding wetlands. The next year, 33 species were counted, and in 2011, 47 species visited the wetlands.